The indescribable word of God became defined when He became incarnate of You O Theotokos. He restored our soiled image to what it was of old by joining it to His divine beauty. We confess salvation, and recount it in word and deed. 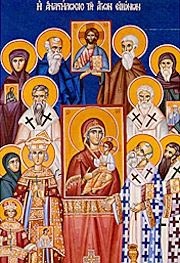 Share the feast of Sunday of Orthodoxy with an icon greeting ecard.